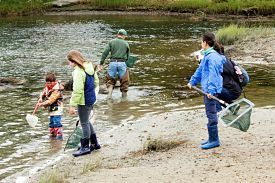 The Massachusetts Cultural Council (MCC), a state agency, has awarded the Lloyd Center for the Environment (Dartmouth, MA) a $7,700 Cultural Investment Portfolio Grant for public cultural programming. “We are thrilled to receive this funding from the Massachusetts Cultural Council. Support from the Cultural Investment Portfolio Program, is essential to our ability to provide quality environmental research, education and outreach to southeastern Massachusetts communities and beyond.” stated Lloyd Center Executive Director Rachel Stronach. MCC’s total budget for the current fiscal year is $13.5 million, which includes annual grants from the National Endowment for the Arts and other sources. Its funds reach every community in Massachusetts. The mission of the MCC is to promote excellence, education, access and diversity in the arts, humanities and sciences in order to improve the quality of life for all Massachusetts residents and to contribute to the economic vitality of our communities. The Council pursues this mission through a combination of grant programs, partnerships, and services for nonprofit cultural organizations, schools, communities, and artists.